Mikie Mahtook, showing off Bull City Blue uniform before call-up. First of all, let us stipulate that Rochester’s Adam Walker can hit a baseball, especially in the general direction of the Bull. He’s done so five times in the last three games, including three times last night. Yes, he does strike out a lot, but here in Durham he’s held that to just 4 times. The crowd even acknowledged his performance last night with a nice round of applause on his third home run. Then, let us also note that Jamie Schultz had a horrible night. Schultz is having a decent season, but his 3⅓ last night was awful. (included two of the Walker homers). Brad Boxberger made a relief appearance (and gave up Walker’s third homer). In our part of the stands a buzz started in about the 3rd inning. Former Bull Kevin Kiermaier, Tampa Bay’s spectacular center fielder, had broken his hand. Several folks were tapping away at their phones. I was regretting that the battery on my radio had died and I couldn’t follow Kinas’ commentary. But soon it became clear enough. In the top half of the inning Richie Shaffer, playing third base, came running toward the dugout asking for a different glove. He was handed one and headed out toward right field, sending Mikie Mahtook in. Here’s the neat part — a fair fraction of the fans knew what was happening — Mahtook was headed to the Rays and we were happy for him — a cheer went up as he went into the dugout. Juniel Querecuto took Shaffer’s place at third base and the game went on. Misty rain through the first couple of innings and a nice rainbow stretched out through the eastern sky. For more on Kiermaier’s injury see the video at Rays Index and comments at the Rays site. The Bulls introduced their fancy blue uniforms last night (see photo at top) and I have to admit that I like the look, with the exception of the slightly ugly awkward looking orange belts. And I have to point out that if you're going all "designer" on us, then the shade of blue on the batting helmet should match. We left after the 5th inning and watched the end of the game on TV. Very pleased to see that the HD broadcast is in operation. Looks really good. 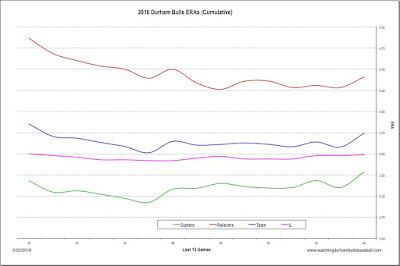 The team ERA was improving until last night. Overall, however, we still see a big spread between the starters and relievers. 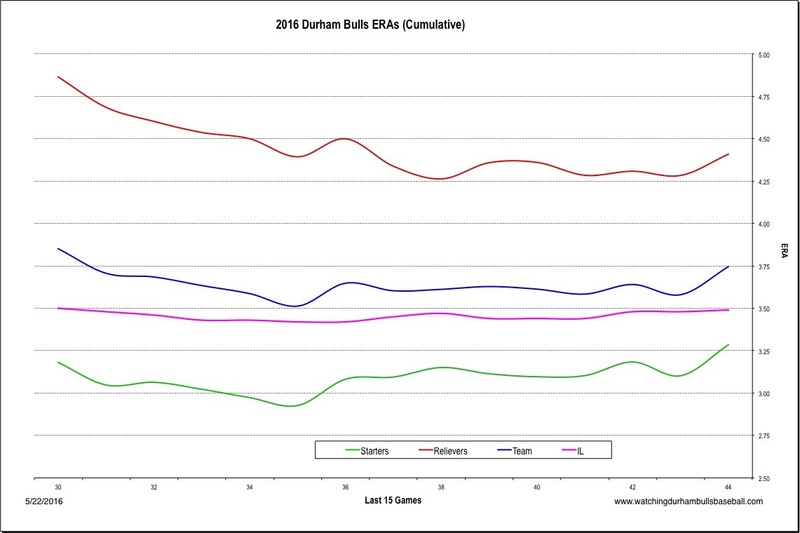 The Bulls have two relievers on the DL and the help that’s come up from Montgomery hasn’t been. If Gamboa and Bellatti return; if after Boxberger finishes his rehab and goes to Tampa Bay; maybe then.